The problem often is that if we go by the book we need to create reference id column eg. “SALES_SIZE_CLASS_ID” in the fact table and then load the whole sales fact table from scratch. 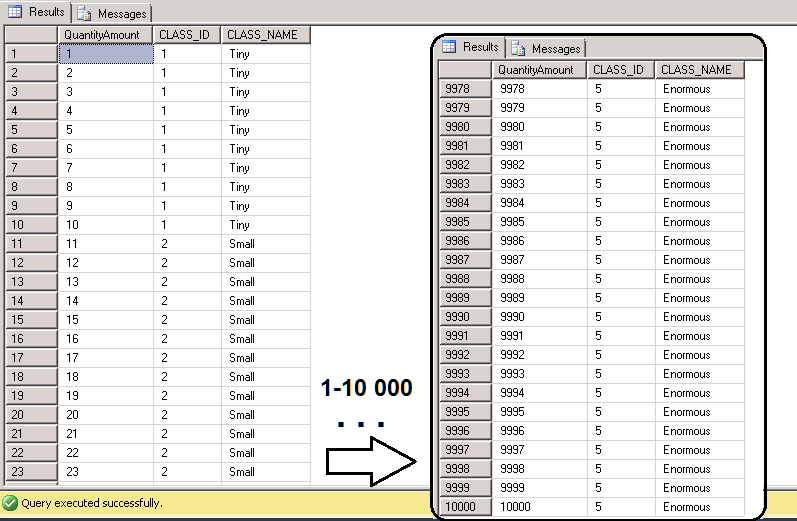 In big environments this could be a bit of a problem because the reloading could take hours and you might need to arrange a downtime window for the production DW.An alternative is use computed columns (virtual columns) and a CASE – statement to get the correct value for SALES_SIZE_CLASS_ID then we avoid the reloading of the fact table. Whenever the sales classification requirements are changing we only need to modify the dimension table rather than loading the possibly enormous sales fact table once again from the scratch. 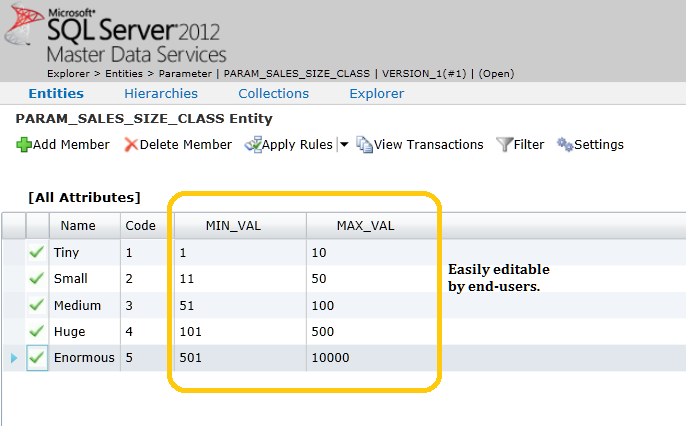 Create new entity PARAM_SALES_SIZE_CLASS with attributes MIN_VALUE and MAX_VALUE to define the limit values for each class. Very easily editable by end-users. Just make sure that the values don’t overlap each other. Then it is time for some SQL magic. 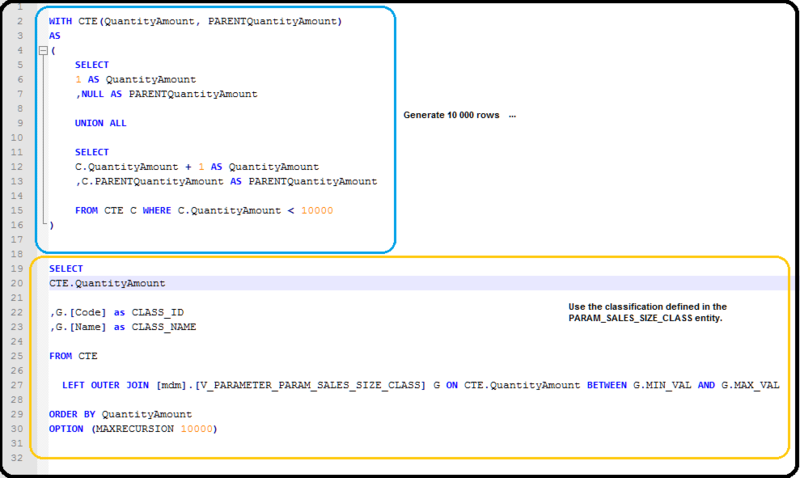 We generate 10 000 rows (or any other value that represents the biggest possible sales quantity size) and assign the class levels by using the minimum and maximum values defined. This will generate 10 000 rows that are ready to insert to our dimension table (e.g. D_SALES_SIZE_CLASS). We now have fully customizable dimension table that can be edited whenever the business users want to and when they need a different point of view for their analysis. This entry was posted on Saturday, September 22nd, 2012 at 16:22	and tagged with customization, data warehouse, dimension, dw, editable, master data services, mds, parametrization and posted in Master Data Services. You can follow any responses to this entry through the RSS 2.0 feed.